This picturesque oceanfront condominium resort is nestled amid 13 acres of lush tropical landscaping and expansive lawns. The resort offers a variety of onsite amenities and activities, including full kitchens and washer/dryer, two pools and jet spas, tennis, BBQ facilities and wireless Internet access. Parking is free and the hotel is just a short drive from Lahaina's shops, restaurants and entertainment. Oceanfront, near restaurants & shopping. 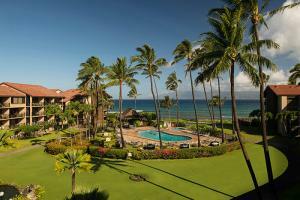 Approximately 5 minutes from Kapalua-West Maui Airport and 45 minutes from Kahului Airport.